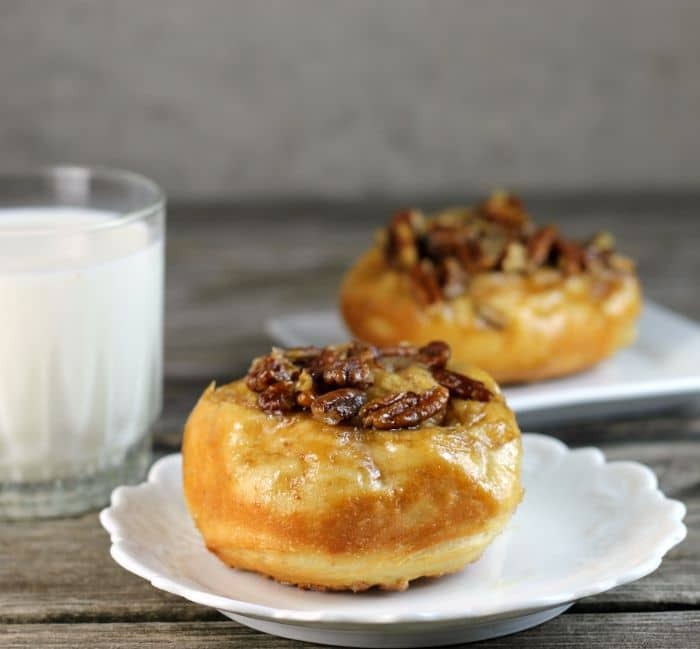 Caramel pecan rolls, you are going to love these sticky rolls with all of the caramel and pecans. 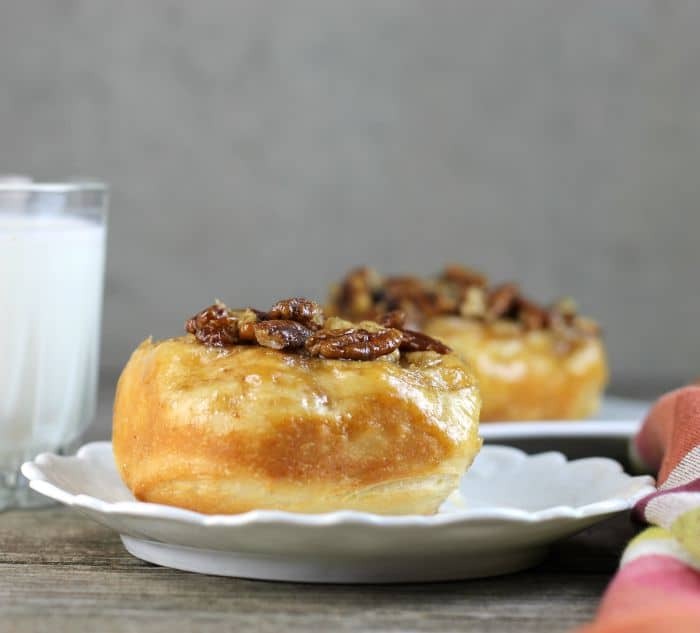 Caramel pecan rolls are a sweet cinnamon roll topped with caramel that is made with brown sugar, butter, and corn syrup. As they bake they fill the house with an amazing aroma that will leave you drooling. My father-in-law has been visiting for the past two weeks from Florida. It has been a blast to have him around. We have been anticipating his visit for months. It is hard to believe that he will be leaving in a couple of days. When he comes to visit you know that there is going to be lots of laughter, game playing, and just a ton of fun. The house has been crazy busy for the last couple of weeks with our kids coming to visit with grandpa. And our grandchildren getting to know their great grandpa. One other thing is the food. I know what his favorite things to eat are so I really love to make sure that during his visit that those foods are served. 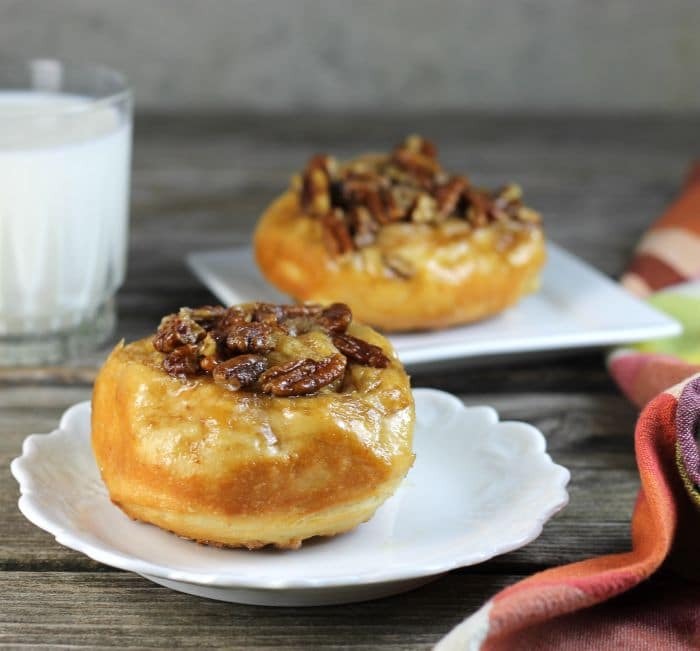 One tradition that is a must during his visit are these caramel pecan rolls. When Mike was young his family went on a lot of camping trips. I have heard the story of when they would head west they would stop at Wall Drug South Dakota. Apparently, there was a place where they liked to stop for caramel rolls. Or at least that is how I remember how the story goes. So yeah caramel pecan rolls are a must when my father-in-law is visiting. 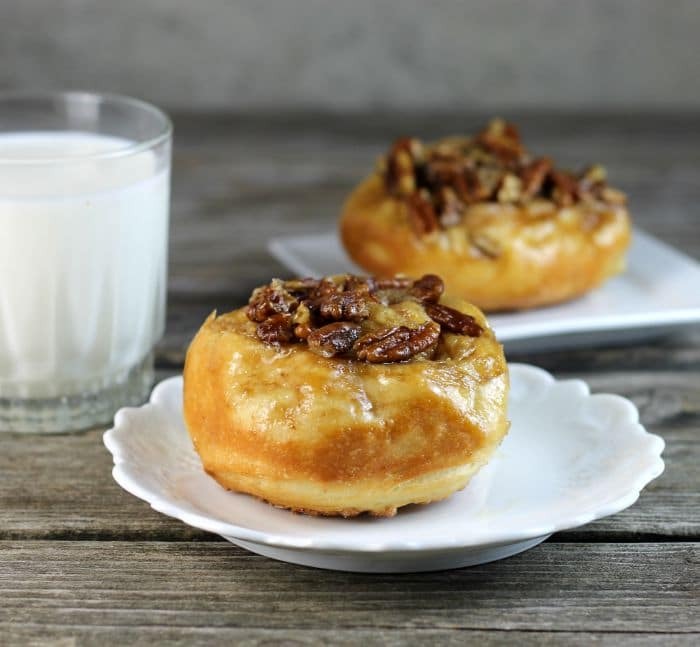 Basically, you can use your favorite sweet roll recipe for this one or follow the one that I have. These are baked in a 9 by 13-inch baking pan. For the caramel sauce, it really couldn’t be easier… you mix brown sugar, butter, light corn syrup, and pecans. Once these ingredients are mixed together you place the sweet rolls on top. Let the rolls rise for about 30 minutes and then bake them. Pop them in the oven and 15 to 17 minutes and you have incredible delicious sweet rolls. Mix together 1 cup of flour, yeast, 1/4 cup brown sugar, and salt. Heat the milk and butter in the microwave to about 120 degrees F. Add to the flour mixture and mix in with a wooden spoon. Add the egg and mix until combined. Gradually start adding the flour. At this point, it can be mixed in by hand. As the dough starts coming together you can start kneading the bread and work in th flour as you knead it. Knead the bread until it is smooth and slightly sticky to the touch. Grease the bottom of the bowl and turn so that both sides are coated. Cover the bread and let it rise for an hour or until double in size. In a 9 by 13-inch baking dish combine the 1 cup of brown sugar, 1/2 cup butter, and the corn syrup. Mix until the ingredients are well combined. Add the pecans and mix well. Spread the caramel mixture out evenly. Punch down the bread. On a lightly greased surface pat the dough out into a 12 by 9-inch rectangle. Take the 2 tablespoons of butter and spread over the surface of the dough. Combine the 1/3 cup sugar and cinnamon and sprinkle it over the butter. Starting with the shorter side, roll up tightly. Pinch the edge so the rolls are sealed. Cut into 12 rolls. A scissors works well for this. Place the rolls evenly in the baking dish. Let rest for 30 minutes. Preheat the oven to 375 degrees F. Once the rolls have rested for 30 minutes place in the preheated oven. Bake for 15 to 17 minutes or until lightly browned. Remove from oven and let cool for a few minutes. Flip the rolls onto a cooling rack so the caramel sauce is on top. Serve warm. They look incredibly delicious and irresistible! My father-in-law owned a pharmacy so I know he took the family to Wall Drug in SD at least on one occasion. Maybe it was for the caramel rolls, too, as I know he loved that sort of treat! Sounds like your FIL had a fun visit. These look great Dawn! It’s so fun to cook for family and I’m sure your father-in-law so enjoyed these rolls! Have a great week! !